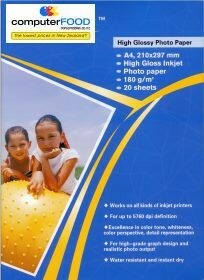 Purchase any Ink Cartridge and you can buy this A6 Glossy Photo Paper worth $3.99 for just $1! Limit - one Pack per ink cartridge purchased. While stocks last. 180gsm Glossy A6 Photo Paper for HP, Epson (non pigment models), Canon, Lexmark and Brother inkjet printers. Great to use for low cost Photo Printing for Photo Albums, Friends etc. Compatible with dye inkjet printers (not compatible with Epson Ultrabrite inks).